This morning I woke up and thought 'I should make a piece of art today' knowing it would make me happy :) Having recently watched some great instructions on how to create watercolour paintings in Photoshop I did some experimenting. 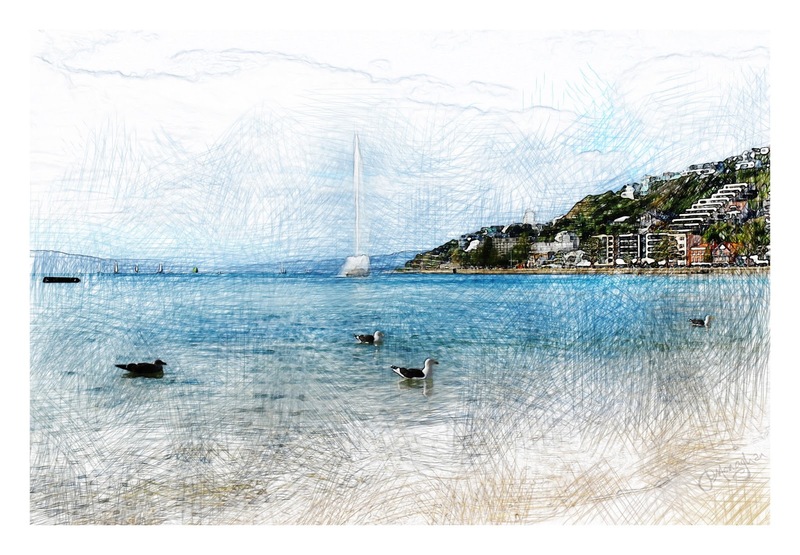 The original photo was taken on a lovely autumn afternoon on the Wellington waterfront. Frank was skate boarding while I wandered down on the beach camera in hand. It was delightful on the beach that day and so lovely to see karoro gulls chilling out, bobbing around gently in the shallow clear water with the famous fountain spraying water far in the air way in the distance. I liked how this brush combination made lines like a coloured pencil drawing or etching as Al suggested. Feel free to click on the image as it's best viewed large! Such fun! I look forward to the next creation.